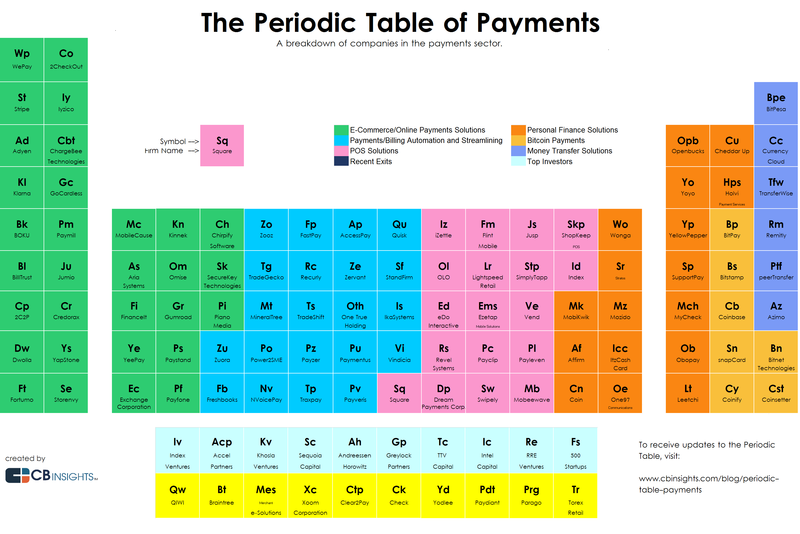 Payments Industry Landscape | What's The Big Data? E-commerce/online payments solutions: Companies including Stripe and WePay that help businesses move their payments-processing online and make it more available, more secure, and cheaper. Payments/billing automation and streamlining: Companies like Zuora and Freshbooks that streamline invoicing and automate financial processes and billing. Point-of-sale solutions: Companies including Square and iZettle that offer point-of-sale products and services, including card readers, stands, and digital storefronts. Personal finance tools: Companies like MobiKwik and Affirm that focus on providing consumers easier and better ways to pay for things. Money-transfer solutions: Companies like TransferWise and Remitly that provide new digital solutions for sending money internationally quickly, safely, and cheaply. This entry was posted in payments, startups and tagged Apple Pay, BillTrust, Square, WePay. Bookmark the permalink.